international law), lecture 3 (subjects of international law, recognition), and lecture 4 (jurisdiction, immunities). The mid- The mid- term will take place in class on May19th. 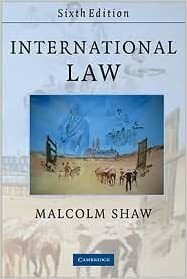 Malc olm Shaw� s engaging and authoritativ e International Law has become the de?nitiv e textbook for instructors and students alike, in this incr eas- ingly popular ?eld of academic study .